My favorite IF album. Bristling with beautiful riffs, this entire album is a joyride. Simply put, In Flames at their best. This is the perfect blend of Heavy riffs, with beauiful harmonies, with extremly catchy hooks. Anders also was at his best vocals wise, as he really is very powerful in this album. This album is the first album that they really got extremely catchy all the way through, and though they probably declined after this slowly, this was their peak. "Embody the Invisable" is probabaly my favorite song by In Flames of all-time. Really the first five songs all are classics, amazing cd that never let up, even the revamped "Behind Space 99" is better than the orginal. Colony takes the heaviness seen on earlier album cranks just a little bit more while keeping the melody. This gives us Colony, which is, currently, my favorite In Flames album, surpassing The Jester Race. Filled with pure shredding epicness and mind crushing brutality, In Flames delivers an amazing album that should be revered as much, if not more, than The Jester Race. Colony mirrors Covenant by Morbid Angel in that it shows that a band can re-use what made their earlier days so great while also looking forward to the future. Embody the Invisible is a highlight, great opener. Many believe that this was the epitomy of In Flames discog. I don't exactly disagree though I prefer Whoracle a little more than this one. The first appearance of the legendary guitar duo (Jesper and Bjorn), and they own the show. Recommended tracks : Ordinary Story, Zombie.inc, Coersed Coexistence, Insipid 2000. Definetely better than Whoracle in my opinion, Colony remains a classic IF album with great songs like "Insipid 200", "ordinary story", "Zombie Inc", " and "Resin"....Entertaining and classic album! Some of In Flames' best songs are on this album, along with some of most distinct and characteristic leads and melodies. The overall package is a unique and crucial moment in the history of metal. This is by far one of the absolute best albums the band has put out. I think they really embodied the heart and soul of melodic death metal in a good chunk of this album. The original lead guitarist featured on here definitely proved his glaring talent. This is definitely one of their best album. The album grew on me so I had to upgrade it a little bit. Gather your faithful and propose a toast to the epoch of indifference. All of the Songs are awesome, just listen to the songs on youtube.com and if like them all go and buy the CD and support the record sales. The album deals with various aspects of religion and spirituality, in positive and negative ways. The pinnacle of the old In Flames sound. Everything here is precise, balanced and crafted brilliantly. The riffs and solos alter between fast and slows tempos but, bar the bass, they never dominate the other instruments instead opting to rise ahead only when needed. It boosts the aggression of the drumming and particularly Anders Friden's volcanic roars who sounds like he is spitting lava with every syllable. Everything combines to create a beast of aggression that crushes with grandiose strides as much as it tears and rips with its speed. This is the last great In Flames album of the old sound. It was only followed by Clayman, an album that wallowed in it's own gluttony before the change to a completely different sound. It may have been the banal The Jester Race that was credited with the founding of the Melodic Death Metal genre but it was this album and possibly Whoracle that are the true examples of In Flames' sound and the ones that should be remembered. Originally gave this a 4.5. Upto 5.0 now, seeing as it's my joint favourite In Flames album now. Tracks like ''Coerced Coexistence'' and ''Scorn'' have really grown on me! On the surface, Colony could be argued as a more polished version of Whoracle, but the more focused nature of the music with some light melodies working their way into select tracks help make this an album that's easy to enjoy by many and is debatably the band's best album sound-wise. In one sentence, it's the perfect balance between "true" melodeath and the catchier, more commercial elements that would start to compromise their sound on Clayman. That, and it's bookended by "Embody the Invisible"/"Ordinary Story" and "Man Made God", which should be all I have to say to anyone who's heard them. If you take the precision and technicality and melody of Whoracle with the overall speed and harshness of Jester Race, you'd get Colony. It's an absolute full on onslaught of great metal. Embody the invisible opens the album with one of the most intense and memorable riffs since Iron Maiden's "The trooper". The album continues to impress with excellent track after another. Each track remains distinguishable and unique. Then right in the middle, as a break from the excellent speed and brillaince is an excellent acoustic piece. After Jester Race and Whoracle, it seemed like things couldn't have gotten better for In Flames. Colony proved that this would be an incorrect assumption, as Colony marked the continued progression of the band's sound, without compromising their quality. 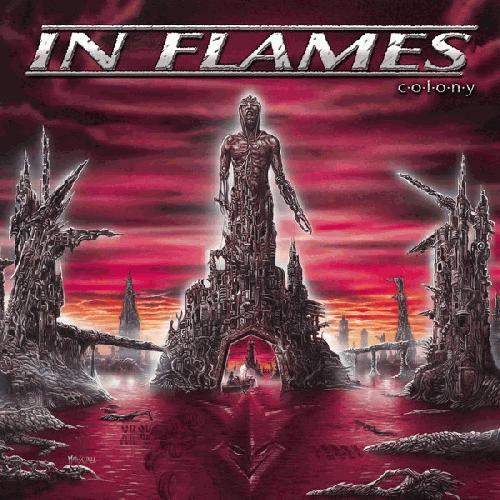 Colony marks the progression towards In Flames' new sound, which isn't a bad thing, at least for this album. It is still definately melodic death metal, and it is still as great as ever. Bottom line why I like Melodic Death Metal: The balance between beauty and roughness. The beauty that comes from the lead guitar riff's occupied with harsh vocals, with sometimes a clean vocal throughout. Solo's are fantastically done in this record, the first time Bjorn Gelotte moved to the guitars and Daniel Svennson did the drums. The great build-ups with the clich� but terrific "heavy couplet, melodic chorus". Songs such as Zombie Inc. and Ordinary Story prove that In Flames deserve to be the leading act of the Gothenburg scene.